The Synthesizer is a broadband source, operating over the range of 300 MHz to 26.5 GHz with a standard resolution of 1.0MHz. The FS5000 can step from any frequency (F1), to any other frequency (F2), up or down, in less than 200nsec. Output amplitude is +10dBm +2 dB into an impedance of 50 Ohms. The FS5000B is housed in a full-rack chassis. 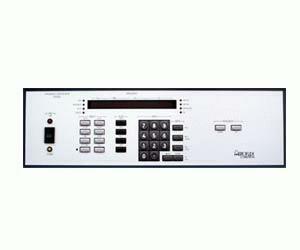 The FS5000B has a front panel keyboard for manual control, GPIB and parallel BCD interface for remote programming.